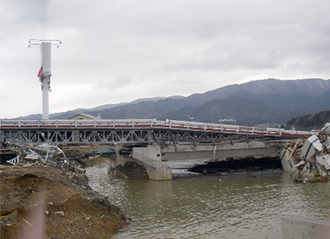 A collapsed bridge was replaced by a temporary bridge to allow traffic. To ensure safe traffic at the earliest possible time, a temporary bridge was used in restoration works. 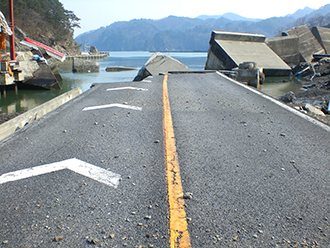 Route 45, which runs along the Pacific coast, was cut in many places by the massive tsunami. 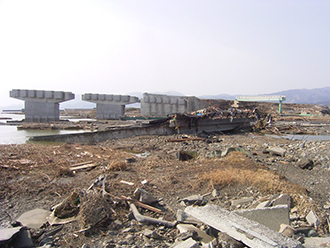 In some places, the damage was so devastating that the bridge girders were swept away. Temporary restoration works were undertaken from the place where the road clearance works had been completed. A detour or temporary bridge was introduced where the bridge was lost. Construction of a total 210.6 m temporary bridge, replacing the Kesen Ohashi Bridge (Rikuzentakata, Iwate Prefecture), was started following the dredging of the river; it was completed only in 61 days. The temporary bridge was opened to two-lane traffic on July 10. 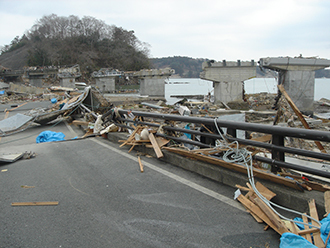 A couple of factors contributed to the “fast” temporary restoration works: the constructors were able to start their works immediately after the earthquake; the construction method studied on-site was fed back and incorporated into the restoration strategy, and immediately applied to the construction method, such as the installation of an temporary panel bridge, etc. 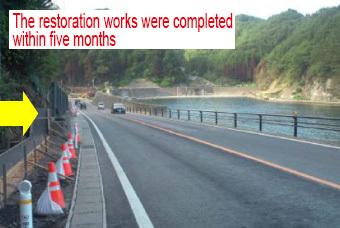 Temporary restoration works of Route 45 were completed on April 10, 2011, a month after the earthquake, and traffic on entire Route 45 and 6 (except for the sections restricted due to the Nuclear Disaster) was secured. 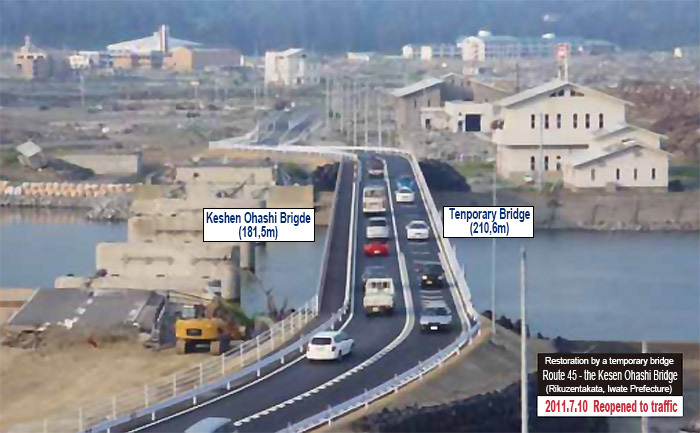 The completion of the temporary Kesen Ohashi Bridge on July 10, 2011 made all the detours over a wide area no longer necessary. Full-scale restoration of the places affected by the earthquake has been in preparation. ①A swept-away road in the Ryoishi area of Kamaishi (March 17). Full-scale restoration of the national highways under the direct control of government, except for the swept-away bridges, was completed (97% of the total length). Reconstruction of the five lost bridges will be coordinated with the reconstruction project of the towns. Detours over a wide area, except for the sections restricted due to the Nuclear Disaster, became no longer necessary as of July 10, 2011. 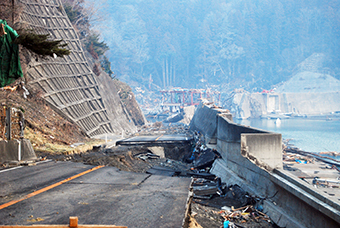 Full-scale restoration of the sections restricted due to the Nuclear Disaster was completed on December 26, 2011.